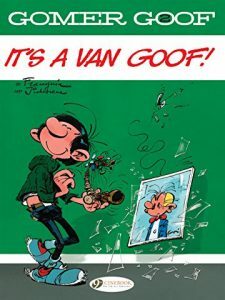 You are here: Home › Reviews › Gomer Goof Vol 2: It’s A Van Goof! Gomer Goof Vol 2: It’s A Van Goof! Gomer’s back for some more ill-advised inventions, misguided moments and short-sighted shortcuts. Poor Fantasio so often bears the brunt of these comic mishaps, but by no means all of them, as Gomer seeks to disperse mosquitos, test balloons and dabble with a chemistry set all with little or no success. Even when he tosses the building’s keys from an upper floor window to the waiting Fantasio below things do not go smoothly, with the keys landing in a cement mixer which then has to be pursued with investigative journalism throughout the city. Gomer is a baffoon and a dunderhead, but his heart’s in the right place, and there’s one character who sees past his bumbling flaws to the man that lies beneath. Miss Jeanne has a soft spot for Gomer, and this is beautifully demonstrated with a full page strip where each panel depicts the next stage of an outing by the pair but with some sort of mishap befalling them. However, rather than see the misfortune, Miss Jeanne sees the rose-tinted side of the situation again, again and again. Rather brilliantly done. All masterfully drawn and packed full of humour, there’s lots to enjoy and appreciate on every page as Gomer inflicts his presence on those around him. A great comic creation now available for English readers to enjoy.